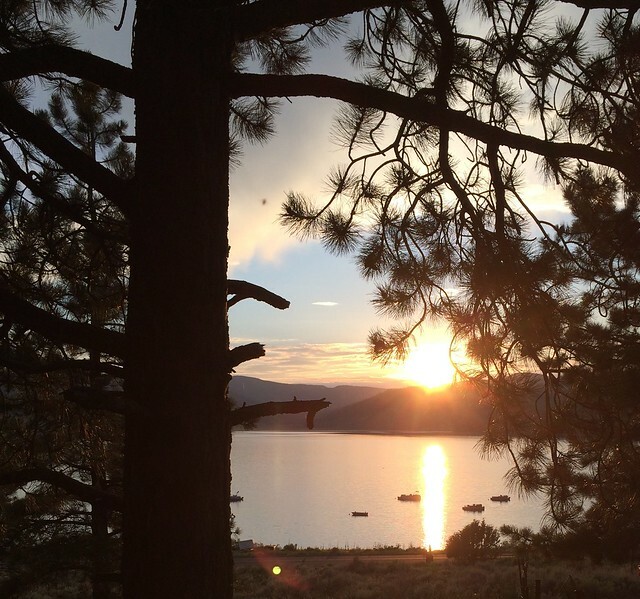 Two weeks ago today I was pulling into the driveway of a tiny cabin in the little Bear Paw fishing village on Panguitch Lake in Utah. Escaping the 110° inferno of Phoenix, when dad and I arrived the local temperature was 70° and slightly overcast. There was a light, cool breeze. It was about as close to my ideal environment as I get during the course of the year. If you’ve been following along, lately I’ve had this kind of minimalist epiphany. Not that we really have that much stuff to begin with, but that’s been more of a financial implication than a deliberate decision. I like having big TVs and fun cars and more rooms in the house just as much as the next guy, but we just could never afford to go crazy with things. Now, however, after just a couple of months of getting a little bit more zen about things, I feel like I’m starting to look at stuff differently, like my attitude has caught up with my paycheck. Since we weren’t hoarders or shopaholics to begin with, it’s really just a mindset shift that I’ve been experiencing: I’m able to better appreciate the simpler things in life. Two years ago, my dad and I used to take our yearly fishing vacation on a small lake way back in the mountains outside of Durango, Colorado. Generally, it was so remote that we were the only ones in the area unless it was a long weekend. Sometimes we would see solitary kayakers on the lake in the morning, but usually, it was just dad and I. Dad and I and the bald eagles and the raccoons and chipmunks and squirrels and cattle calling out to greet the sun as it came up over the forest. 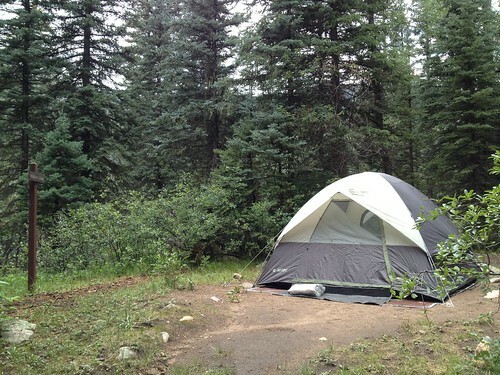 This is why we camp…to get away, get back to nature, and unplug. Fast forward to July 2014, and we’ve exchanged Colorado for Utah for the second year in a row. Tents have been traded for a cabin. Sleeping bags for springy beds. A cold trip via flashlight to the outhouse 200 yards away for a short walk across a squeaky floor to a bathroom with a flushable toilet and a shower. 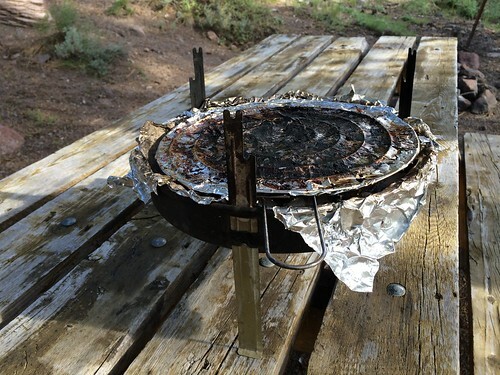 Every meal cooked over an open fire for most meals prepared on a gas stove. A cooler full of ice for a refrigerator. Hot water. Electricity. I could be completely okay with all of these upgrades if it weren’t for one thing: other people. Just like last year, the tiny cabin dad rented is flanked on all sides by RVs. 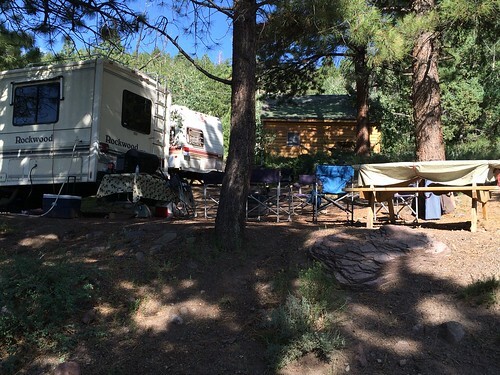 “Recreational” Vehicles…behemoths that take half an hour to back into a spot with generators and awnings and satellite dishes and loud televisions and ATVs and solar panels that block my view of the sunset over the lake. I get it…most of these folks are retired. They worked their whole lives and saved up and bought these personal tour buses so they could spend their golden years driving around the country and living wherever they want and doing what they want to do. I mean, that’s the same reason I’m at the lake too, isn’t it? But the thing is, that they don’t seem to be doing whatever it is they want to do. They’re spending all their time taking care of the junk they hauled up there. After the daily afternoon storm, there’s an exodus, people shuffling outside to dry off their quads and propane barbecue grills and to realign their satellite dishes. Every night they pack up the toys and the chairs and the grills and the fishing equipment lest it gets stolen or the storms blow in again. Every morning they come out and do it all over again. And I think that’s what really bothers me…I feel like these folks are missing the whole point of being out here in the first place. Why drive way out into the woods in what could arguably be one of the least fuel-efficient land vehicles out there (at 11 miles a gallon) to spend your time tending to your stuff? We’re surrounded on three sides by forest and a big beautiful lake on the fourth. Besides the relatively little time spent fishing and the occasional evening campfire, most of our fellow campers rarely ventured out of their RVs, blue TV light flickering from the windows. Maybe I’m projecting the point of my vacation onto them. Maybe that’s exactly why they’re up in the mountains. Who knows. What I do know is that I’m there to get away from my TV and my phone and my email and my job and my stress. I’m there to go for walks. To hike up a mountain trail and wander across deer munching on pine cones. To read a book in the shade of the fragrant pine trees. To feed the chipmunks. Not to listen to your satellite TV broadcast the latest episode of Jerry Springer from three spots down. This is one of the views from our picnic table. All of this stuff is hauled out and arranged every morning and put away every night, twice if there’s a storm. And by the way, there is always a storm. It is the monsoon season, after all. To be fair, out of frame (in the shade) are the two camping chairs we brought that are more comfortable than the picnic table benches. On the table is my dad’s cheap camping barbecue grill, the same one we’ve been grilling steaks and the trout we catch on for years. It’s not the biggest, or the hottest, or the fastest, but it gets the job done, it breaks down almost flat for easy transport, and best of all – it’s easy. If a storm rolls in, guess what? It gets wet. If it gets stolen, he’s out about five bucks. We don’t stress about it. We don’t have to clean it after a cloudburst. A new sheet of aluminum foil when it’s time to cook and it’s good to go. More importantly, we get to spend that saved time a better way: talking, or hiking, enjoying a cigar and each others company, which is the real reason the two of us are there anyway. Which makes me wonder…I wonder if the people in the RV next door felt sorry for us while we cooked on this tiny grill and had nothing to watch while we ate but the sunset? We spent our last day of our fishing trip much the way we spent the previous four: get up early, drive down to the lake, climb down the steep embankment to dads “lucky” fishing spot, fish for a couple of hours pulling in a total of one (mine, thankyouverymuch), before deciding to call it quits. The decision to bail was made easier by the fact that I developed a knot in my line that took me the better part of an hour to untangle, and that dad, who seems adverse to using sunscreen was beginning to burn. After a giant lunch consisting of most of the food left in the fridge that dad didn’t want to haul home, we decided to drive up to the ski resort town of Brian Head. I had managed to talk him into playing a round of disc golf while there, but the course was closed on Thursdays. While talking to one of the employees there about the course a couple of college coeds showed up who wanted to ride the ski lift (also closed) so we were brushed aside so he could flirt with them. We stopped for a couple of photo opps at Cedar Breaks National Monument before coming back to our home away from home, and began to plot our evening: dinner, then fish some more. 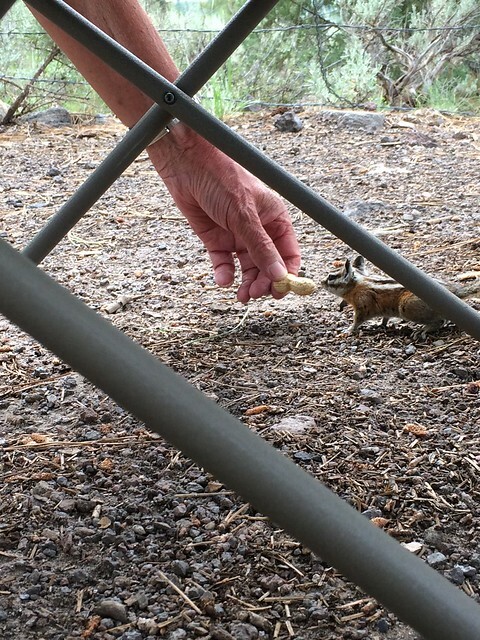 Fortunately, neither one of us wanted to go back out in the sun with the high likelihood of not catching anything, so after an afternoon of reading and relaxing we spent the rest of the evening cooking dinner and feeding the chipmunks. After dinner, the Chipmunk Whisperer and I lit up a couple of the cigars I’d brought and we puffed away and watched the sun set over the lake. From our vantage point, we could see when the fish began feeding on top of the sunset-bathed water, a little sad that we weren’t out there but reassured by the knowledge that if the previous three days were any indication we wouldn’t catch any of them anyway. We did see birds of prey dive-bombing the water and coming up with fish almost as large as they were…without spending a small fortune on a resort stay, fishing gear, bait and tackle, of course. Once again, I’m reminded of how much I enjoy these times with dad, when we’re not really doing anything, just sitting and soaking up the remnant of day. Dad, once again, got the chipmunks to come up and take peanuts right out of his hand, not something they will ever do with me. We sat and talked and laughed until we coughed on the cigar smoke, and when the sun finally dropped below the horizon he went inside, leaving me to finish my cigar while the small night birds chirped in the pine trees over my head. Freshly back from a fishing/camping trip with my father, I decided to try to quantify the time graphically. And since infographics are the flavor of the month, what better way could there be to illustrate a week in the great outdoors?